(CNN) -- Recent developments off the coast of Sweden raise many questions, and we do not as yet have answers. Last week, Swedish media reported that the country's military was searching for an underwater vessel, possibly a Russian submarine, after an emergency radio transmission allegedly made in Russian (although Russia has denied it has any vessels in Swedish waters). Now, as the Swedish Navy continues to search for the unidentified undersea vessel that may have penetrated the country's territorial waters, it's worth keeping in mind some key facts to help place the issue in perspective. For a start, anti-submarine warfare is complex and very difficult to execute properly. Especially in the close confines of territorial waters, the advantages tend to accrue to the submarine. The rocky floor of an inland sea like the Baltic can mask acoustic signatures that give watching ships, helicopters and maritime patrol aircraft the ability to track and identify a subsurface contact. Second, this is happening against the backdrop of the Swedish Navy and Air Force having suffered significant budget cuts over the past decades. As a general proposition, the Swedes have a capable and professional force. But since the end of the Cold War, they have not invested heavily in anti-submarine warfare capability. They are not alone in this regard -- many of the other European nations have likewise cut back in this area given a sense that anti-submarine warfare was something they would have needed against the USSR during the Cold War but less so during pre-Ukrainian crisis days with Russia. And although Sweden is not a NATO member, meaning this operation is a national effort, it is a very strong partner to NATO and has been involved deeply in positive ways in Afghanistan, the Balkans, Libya and other operations. Yet the fact remains that there is no treaty obligation on the part of NATO to be involved. If the Swedes ask for help, it is likely that NATO would respond, but to date they have not done so. Ultimately, though, we may never know exactly what has happened. It is entirely possible that a Russian submarine was performing an intelligence-gathering operation, and that it had a period of distress that alerted Swedish authorities to its presence. It may have sorted out its challenges and slipped away. Or it may be still operating in close while Russia sorts out a plan of action. The most recent volley from Russia, that it might be a Dutch submarine, seems highly unlikely. If it was any other nation's boat, they would have likely worked with the Swedes immediately if their vessel was in distress. The Swedes, who are capable and professional, seem insistent on their concern about an unknown undersea vessel. And the reality is that they have no reason to make any of this up, instead forthrightly reporting what they are seeing. 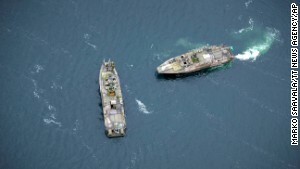 With this in mind, NATO should offer to assist with other assets and help sort out the situation, especially if there is any possibility of a vessel in distress -- no matter what the circumstances of its presence in the Baltic.